I wasn’t sure I wanted a One Word for this year. The past several years I have picked a word and then at the end of the year I found myself frustrated at my lack of growth in that area….I am one who can be easily discouraged so I thought that maybe I would skip out this year. If you read my post about the word Depend for 2015, you will know that last year pushed me to limits I didn’t like and in many ways I felt initially like I had failed once again. But I couldn’t put the idea of not having a word for the year to rest so I have been thinking about it for the last few days. And then this morning I sat down to read a book I was sent as part of another book launch team. 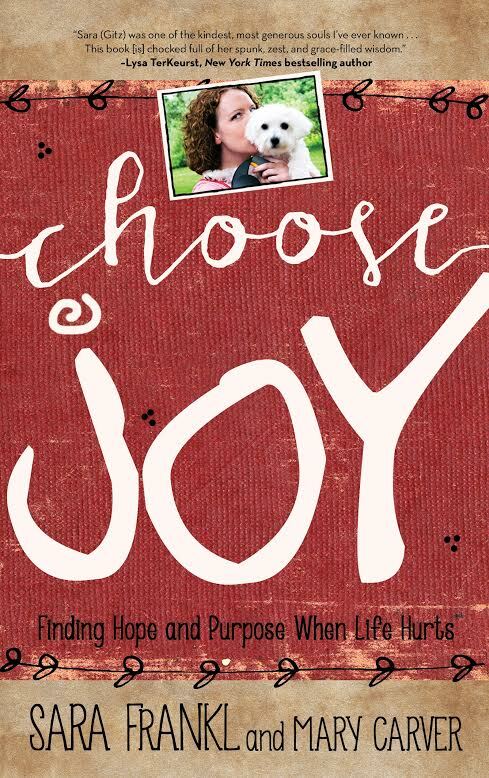 Choose Joy – Finding Hope and Purpose When Life Hurts was written by Sara Frankl and Mary Carver. It is available for purchase on Tuesday January 5th and I guarantee this is a book that you want to read to start off the new year. I read it in 3 hours, straight through, and have underlined so many sections so that I could read and re-read the truths within the pages. It is so simple really and yet something that I struggle with in a deep way. How do we choose joy when life hurts? I had been thinking up until then that maybe my One Word should be truth or freedom…things I really want for myself in this coming year. But at that moment I knew that #CHOOSE was the word I wanted to start my 2016. It is something that I can apply to any area of my life really. And it is so simple, I just have to Choose. 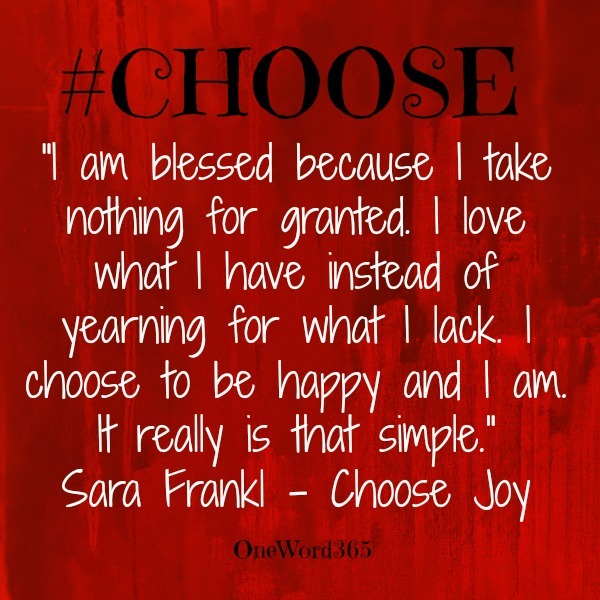 Choose to seek joy even when I feel unhappy. Choose to find truth, my truth, and live in a more honest and transparent way. Choose to see others for all of the good things that they embody, instead of focusing on any negatives. Choose to be grateful for the growth in my life even if it is painstakingly slow at times. Choose to trust God with the big and the small. Choose to make time for a relationship with God. Choose to be more patient and kind to those closest to me. Yes it seems so simple, but for this human girl with her need for control as well as pride and anger issues….if I am being honest, at times it seems like I don’t have a choice. Sometimes I have to fight for it….but I always have a choice at how I am going to respond to the life I am living. For a long time I have played the victim. Poor me and how I have been hurt by someone, or life didn’t turn out the way I thought it might…boo hoo. If only things would have gone this way, then my life would be perfect. I have had unrealistic expectations for myself and others and when they aren’t met (because they can’t be) I find myself unhappy and discontent. Talk about a a smack in the face moment…such truth there! I know that when I place my feet firm in the ground on a truth like this I am bound to find myself in situations in the coming weeks and months that will challenge my desires to choose well. Maybe that’s one reason why I didn’t want to pick a word…because I have seen it happen to myself and others and I am so weary from this past year I don’t know if I have the fight in me to walk forward well. But I realized that in this too I had a choice. I can choose faith or I can choose fear. So today I choose to trust that God will be walking with me in 2016, guiding me, refining me and helping me to shed some of my old baggage so that I can better be used by Him. Yes it is simple if we let it be. What will you choose for this new year friends? It is my prayer that we choose to seek God and try and be the best we can be for His glory. Did you choose a One Word for 2016? I’d love to hear it!! This entry was posted in #Choose, Choose Joy, One Word 365 and tagged #Choose, #OneWord365, faith on January 2, 2016 by Kristin. How is it possible that another year has passed? I can’t even remember where December went and am still trying to wrap my mind around the fact that it is New Year’s Eve tonight. I haven’t written a lot in the past few months but felt like I needed to pen my thoughts on my “one word” for 2015. I wish I could wrap it up in a pretty red bow and tell you that I finally picked a word for the year and mastered it in my life. Unfortunately, I find myself at that place once again where I feel like my hopes for what my word was going to be are instead a reflection of my failures of not following through. I read back through my post last January and remember the challenge I was placing before me. Depend on God in everything. Look to Him as my source of comfort and hope. Could I place my dependence on Him in every aspect of my life? The answer, quite frankly, is no. The reality is that I am a Type A person to the core. I like things my way, I want to manage my circumstances and the outcome. I don’t like the unknown. And I certainly don’t like making mistakes or being wrong. So while I found myself at the beginning of 2015 in a place where I was eager to give up that control and depend on God instead, somewhere along the way…and I am guessing rather quickly, I decided that I could speed things up and manage my life (and others) well enough on my own. Can’t you just see my head growing with ego and pride!? He was always there with me, but for the majority of 2015 I worked pretty hard at trying to keep my life all under control on my own. The difference this year from years past is that when things went wrong I didn’t blame God. It has never been that He wasn’t there to guide me…I just stopped asking for His help. So while I find myself at a place I hoped I wouldn’t be, I am trying to see this as a challenge instead of a failure. And in many areas of my life I can be a slow learner. Thankfully I have a God that is patient and long suffering. I am not perfect (while I so desperately wish I were) and I am very slowly seeing the benefits of letting go of the things I can’t control and trusting God through it all. I don’t have full dependence on God mastered at the end of 2015 and I am beginning to believe that this will be something I will continue to work on for the rest of my life. Today I am ok with that. Friends as we watch the final hours of this year tick away can we try and focus on the small steps forward instead of the seemingly big failures? Let’s start the new year grateful for the challenges of the past and hold onto hope in our continued growth in the future. It has been a blessing to walk this past year with you – Happy New Year! 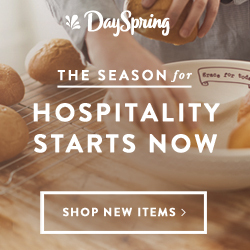 This entry was posted in A Look Back, Depend, One Word 365 on December 31, 2015 by Kristin. Can I be honest with you? I didn’t really want a “One Word” for 2015. Because finding Balance was such a BIG failure for me last year…I just felt like I would be setting myself up for failure once again if I joined in. For a few days I thought maybe I would choose a word and that would be “intentional”, because seeking to be more intentional with my family, my writing, my quiet time etc., were all good things. Right?! I even had a beautiful graphic made from a FB friend…but something didn’t seem right. And late in the hours of the final days of 2014 I knew that God was speaking to me. Sometimes He does that through a thought, a prayer request when I am in the shower….but this time it was through the voice of my friend Christine. I was struggling with something and asked Christine and Gindi for prayer. They have become mighty prayer warriors in my life. Voxer has been a gift and has allowed us to communicate daily and find ways to pray for and encourage one another. So this particular morning Christine left me a message with words I felt God wanted me to hear. Where and with whom does my dependence lie in? Is it in things of this world, of people?? 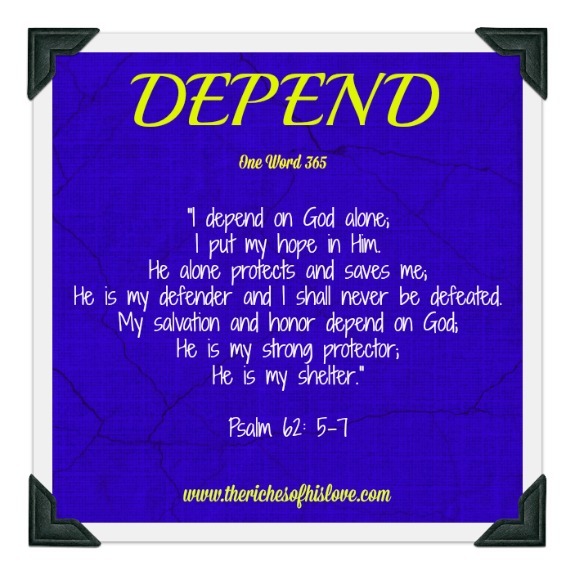 Or is my full dependence on God? 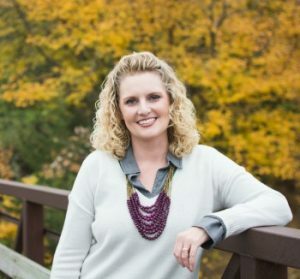 Christine’s words hit home because I knew that I had been trusting God with SOME things, but not everything. Can I place my full dependence on God? For everything? And so the journey this year begins. To seek Him, dive into His Word, to know Him and try and understand His plan for my life. To give Him my everything. My hopes and my fears, my worries and my doubts. My joys and triumphs. I want to surrender my control and fully depend on God. Writing those words are scary. What path might I be taken down to test my faith, my dependence on Him? I have a feeling that this year will be one of growth and change, and while it is scary I am committed to seeking the One who has already brought me through so much. In every trial, every blessing, God has been there. So even if I am certain of only one thing right now, it is that He IS with me. And that truth is enough to start my journey of depending on God in everything. Did you choose a One Word for your new year? I’d love to hear what it is if you did!! This entry was posted in Depend, One Word 365 and tagged #OneWord365, Depend, One Word 365 on January 1, 2015 by Kristin. I am not one to make resolutions. For me it is a quick set up for failure. I almost never keep or meet a resolution and become more discouraged in the process. Then I heard about this idea a few years ago where you choose one word that you want to permeate your life in the new year. It isn’t a resolution, but a word to focus on in all areas of your life. Over the past few months it has become painfully clear to me that the area I most struggle with in my life is balance. Finding balance between home and work, mom responsibilities, my creative time and quiet time with God….the list goes on and on for me. I haven’t been balancing everything well and tend to find myself tired and stressed out. I am an early riser in the mornings. I like to have some time to myself before everyone else gets up. But even in that area, I don’t always use my time well. Should I read the Bible, exercise, get an extra load of laundry done or read a chapter in the book I am doing for a book club? Should I stay at the office and work late so that I am not stressed at work? But then I am sacrificing quality time with my kids during the few awake hours that they have with me. I can not do it all. I just can’t. But I can work at finding a better balance so that I am not feeling guilty or regretful all the time. I don’t yet have the answer to how I will find this balance. But I felt strongly that this is something that God wants me to work on this new year. And as in all things, I look to Him first to help guide me in this new way of thinking. From time to time I will be sharing how things are going – what new things I am trying, those things I might have to give up to help create more balance and I will even share with you the ways that I have continued to fail! 🙂 Because change doesn’t happen overnight, I don’t expect to wake up on January 2nd having it all figured out. 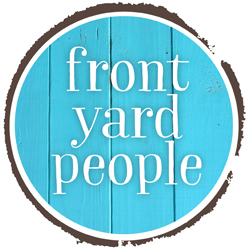 So there we go – my start to a new year of seeking and finding Balance. 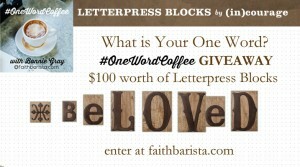 Do you have a One Word for 2014? If you do I would love to hear it!! And join us over in the One Word 365 community where you can find encouragement from other people that are trying to live purposefully as well! 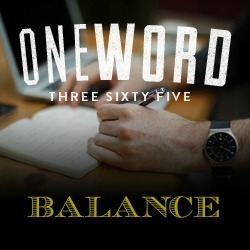 This entry was posted in Balance, One Word 365 on January 1, 2014 by Kristin.